The aim of this research is to investigate the hydroecology of microbial mat communities in hypersaline lakes to try to assess the limits of environmental conditions that enable microbialite formation. Thus, the microbial communities will be characterized in combination with different physicochemical water properties. Samples of microbial mats will be seasonally collected and total deoxyribonucleic acid (DNA) will be extracted then submitted to Polymerase Chain Reaction (PCR) and high throughput sequencing. Simultaneous lake water and mat pore water samples will be taken and water quality parameters will be measured, for example, total and dissolved nutrients; common ions; metals and rare earth elements (REE). In-situ measured water quality parameters will include: water depth, pH, temperature, salinity, turbidity, total dissolved solids, dissolved oxygen, redox potential and electric conductivity. Statistical methods including Principal Component Analysis (PCA) will be used to investigate the correlation between water quality, microbial diversity and system dynamics in the different occurrences. 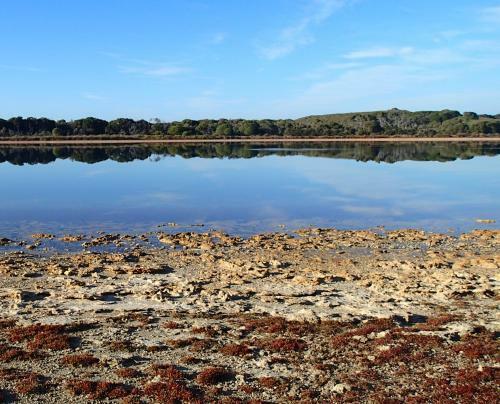 This will be the first study thoroughly investigating the hydroecology of microbial mats in salt lakes, with Rottnest Island being the main field site. This will provide insight into the origins of these communities, the mechanisms by which they form microbialites and inform The Rottnest Island Authority to allow better management of these important biodiversity assets. The data obtained from this research will be beneficial not only from a basic science standpoint of improving our understanding on the origin of microbial mats and the mechanisms by which they for microbialites in Southwest Western Australia, but will also provide key insights to better inform and guide future environmental management programs addressed to microbialites conservation. In addition, the proposed research results may encourage the development of other future microbialites studies in Western Australia.